In one scene Amy is in the recording studio working with Mark Ronson. She's standing in the booth, singing 'Back to Black'. Mark mentions in interview that the lyrics and melody poured out of Amy in just two hours. What struck me as I watched this scene was how Amy appeared to sing with minimal effort - she stands there almost nonchalantly, leaning on the back of a chair, hand in her pocket - and yet she sounds phenomenal. That's the thing about Amy - no one can deny she was a fantastic singer and songwriter. This scene proves that when she made music it was an act of pure creation. The song came straight from her heart because she was brave enough to reveal her truth to the world. It shows that when we speak from the heart, magic can just flow from us. Amy's talent was extraordinary, raw and beautiful. She had a remarkable gift. 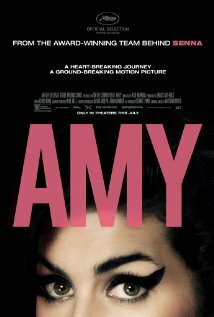 She may have died young after a tragic descent into drugs, alcohol and bulimia, but thankfully Amy left behind a musical legacy of extreme importance. Her music lives on forever.